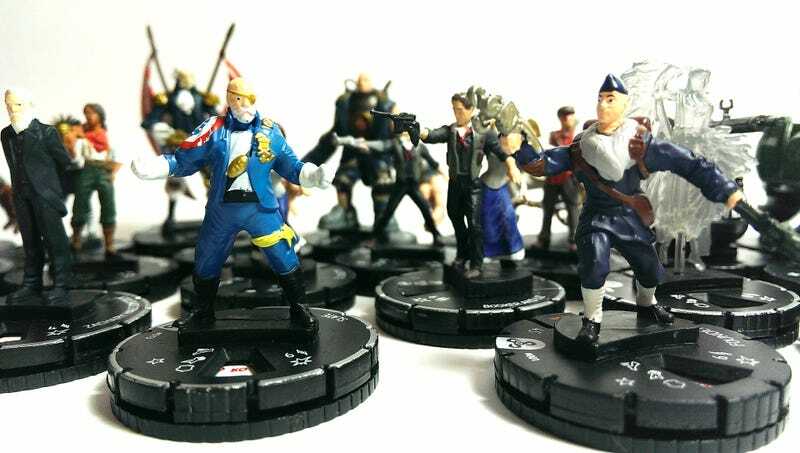 As promised back in April, the folks at WizKids/NECA have come through on the BioShock Infinite front, delivering a set of tiny playable figurines that look just like the promotional, only with incredibly sloppy paint jobs. HeroClix players — action figure collectors in general, really — are used to these discrepancies between announcement images and the final product. It's due to the fact that production pieces are painted by real people, and promotional shots are crafted by angels. It's true. What we've got here is the BioShock Infinite starter set, a fine selection of six figures(including my personal favorite, horse), and a box of 24 blind packs. I ended up with about ten doubles, but you can never have too many Bookers. I'm sure the rulebook included in the starter kit will contradict me on that. The starter kit also comes with a pair of dice, object and terrain tokens, and a double-sided BioShock Infinite playfield — enough stuff that I could, given the chance, actually learn how to play. As long as you don't get too close the figures are quite nice, easily recognizable as their respective characters. While I am most fond of horse, old man in suit and good old Mrs. Commstock would probably be my best friends if they weren't small pieces of plastic. The BioShock Infinite HeroClix starter set ($19 or so) and packs ($2.50-ish) are set to go on sale later this month. I would not suggest eating them.